"I would like you to know how enormously we all enjoyed our week on M/S Aventura. The coast that we visited was amazingly beautiful, the bays in which we moored astonishing. The views were stunning, the water enticing for swimming and the tranquility a rare treat. Hüseyin was a most responsible captain with an excellent sense of where to moor. Sadullah seemed an excellent captain's mate as well as an outstanding cook. We all delighted in the meals he created for us. An added bonus was that they both understood that after dinner we were happy to be alone and did not need them sitting up with us. " When there is just you and your partner, and perhaps one or two other couples on your holiday for Greece or Turkey. 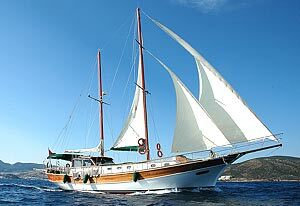 The gulet will usually take a predefined sailing route. With a private charter or full charter you and your party will have the whole gulet and its crew at your disposal with a decisive say in the route/itinerary and the activities. Just think of it as your own private charter yacht. The M/S AVENTURA (formerly SERIN) is a superb motor sailor and has been totally refurbished last winter when it changed hands. She is a wooden boat construction built in the typical Aegean coast tradition. She has 3 cabins for up to 6 guests. 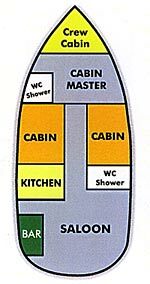 There is a master-cabin with ensuite bathroom with modern toilet and home style shower-cabin and two more double-bed cabins who share one bathroom of highest standard. She comes fully equipped with VHF radio, GSM telephone, dinghy with outboard, stereo music system, 2 canoes, fishing and snorkeling equipment, generator, inverter and continuous hot water. The crew of M/S AVENTURA consists of a captain, and a cook, that will bring to you all the delicious dishes, the Turkish cuisine has to offer. More on food on board here. The captain speaks very good English and gives you a lot of insider information. Comfort/Recreation: Spacious sun deck area with sun mattresses and cushions, Sun awning, spacious dining area with bar and dining table. There is nearly none of the gullet charter-companies who tells you the truth about air-conditition on Gulets. Yes, some do have AC and you think vou can switch it on when you like. It's not! On a boat the AC can only run when the generator is on, or in a harbor when connected to 220 Volt. But mainly you are in anchor bays, often next to a neighbor who doesn't like the noise of your generator and you wouldn't like it either during the night for example. The M/S Aventura meets international safety regulations including life jackets, fire extinguishers and alarms.